Did Lana Del Rey just threaten to beat up Azealia Banks? 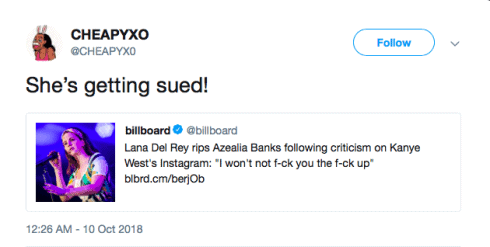 The music world’s bitter battles over politics escalated into Lana Del Rey threatening to physically fight Azaelia Banks. The rapper hit back at the “Video Games” singer by offering to take her to court instead. “If you think it’s alright to support someone who believes it’s OK to grab a woman by the p**sy just because he’s famous-then you need an intervention as much as he does — something so many narcissists will never get because there just isn’t enough help for the issue,” Lana continued. Azaelia Banks responded to Lana’s comments to Kanye on Twitter by calling her out for collaborating with ASAP Rocky last year. “Wow okay Lana, this would be cute if you were consistent with your outrage and refused to collab with ASAP rocky who has physically assaulted women too,” Azealia wrote. “To me this just looks like the typical White woman taking using a weakened target to ‘pretend’ to be an ally.” ASAP Rocky was charged with a misdemeanor in 2013 for stabbing a female fan. Azaelia went on to tell Lana she needed to apologize to Kanye for trying to place blame on him for Trump’s indiscretions with women and then accused her of not caring about ASAP Rocky’s actions because his victim wasn’t a white woman. It took Lana over a week to respond to Azealia, but when she did, she didn’t hold any punches. “U know the addy. Pull up anytime. Say it to my face. But if I were you- I wouldn’t,” the singer wrote yesterday. “I won’t not f**k you the f**k up. Period,” she followed up in a stand-alone subtweet. “Banks. u coulda been the greatest female rapper alive but u blew it. dont take it out on the only person who had ur back,” Lana continued. Azealia’s answer was that she planned to sue Lana for physically threatening her online. She also went on a detailed attack on Lana’s appearance. Lana fired back with offering to hook Azaelia up with both her plastic surgeon AND her psychiatrist. “I’ll send you my surgeon’s number and a good psychiatrist I know in LA — your psych meds aren’t working #uneedanewcocktail,” Lana responded. Is “You Oughta Know” really about Dave Coulier? Was Hayley Williams of Paramore’s Twitter hacked?